The door to Laurie Fox’s house won’t open. Maybe it’s damp mildew inside that caused the door to expand in the heat. Maybe it’s the sagging roof. Either way, it’s a metaphor for the post-Sandy mess that has kept Fox out of her house for 43 months, with no prospect of returning. Fox’s home is in Forked River Beach, a section of Lacey Township. And, like thousands of others, she continues to live somewhere else. For many Jersey Shore residents “the disaster after the disaster” – shorthand for the Sandy recovery – continues as another summer approaches. Over the last few weekends, Gov. Christie Christie did his annual Shore tour, walking the boards at Seaside Heights and Point Pleasant and Asbury Park. “It’s to remind folks how great the Jersey Shore is and how great we’ve recovered from Sandy …,” said Christie said in downtown Ocean Grove a few days ago. By “people,” he means tourists and by “down here,” he means the beachfront towns. By those measures, Christie is right. In the Belmars and Point Pleasants and Seasides of the Shore, the boardwalks are new, the pavilions are open and the beaches have been expanded. But the Sandy recovery is really a tale of two Shores. The 127-mile tourism stretch from Sandy Hook to Cape May is open for business. The rental market is healthy, boardwalk rides are spinning and you again have to wait in line for an ice cream cone. The other Shore is where the tourists don’t go – the inland side of the Barnegat Bay, the bungalow neighborhoods of South Jersey towns where the pines meet the bay. Those are the places where the hurricane’s stomping footprints are still very apparent. Of the 7,776 people in the state’s RREM (Reconstruction, Rehabilitation, Elevation and Mitigation) program, 3,634 have received certificates of occupancy, meaning 4,142 may not still be home. Fox is one of those people. She got $51,000 in insurance money for her home and furnishings swamped by the tidal surge and wind-whipped waves of the Barneget Bay. That was $24,000 less than she paid for the house in 2001, even though the modest home of less than 1,000 square feet had new siding and a new roof. “I was always trying to make it nice,” she said. Fox, 50, has learning disabilities and can find only limited employment, but collects no disability. The little house by the bay was her dream and security. Then came Sandy. The water came up and a tree came down. Long story short, between computer glitches, lost paperwork, being handed off to 10 different state recovery counselors, her first builder being thrown out of the RREM program, a second builder demanding she settle for a smaller house built sideways on the property, questions (in triplicate) about her residency that she answered (in triplicate) and the state asking for proof of work done that was never done, Fox remains homeless, couch surfing with a friend. “I think it’s a conspiracy to drive out people like me so the developers can take over and build million-dollar homes,” Fox said, not joking. In her neighborhood, there is evidence. Many of her old neighbors are gone, their one-story homes replaced by three-story beach manses that tower over the landscape. As many as 5,000 people dropped out of the RREM program along the 3 ½-year journey of paperwork, paperwork and more paperwork. Some, after not getting fair insurance payments while paying taxes on their property and rent to live elsewhere, didn’t have the money to rebuild and elevate — even with a state grant. Sue Marticek, executive director of the Ocean County Long-Term Recovery Group, said more and more people are turning to nonprofit builders, desperate to keep their properties. 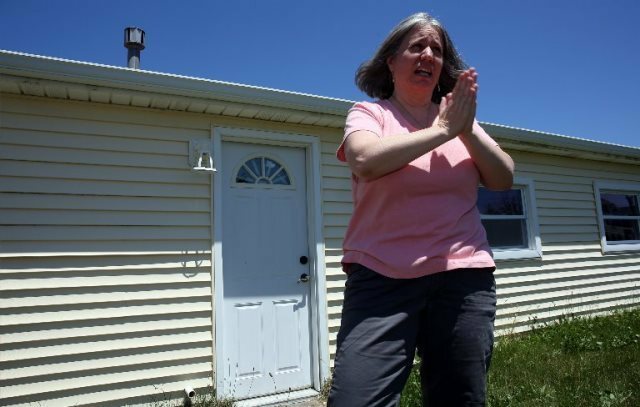 Marticek said the groups – Habitat for Humanity, A Future with a Hope, the St. Bernard’s Project and the Affordable Housing Alliance – are getting pleas for help faster than they can handle them. Still, there is no way to quantify the number of people who remain out of their homes. For example, Toms River has sent out more than 4,000 letters to residents of substantially damaged homes, notifying them to raise their houses in compliance with post-Sandy flood elevation codes. More than 2,000 people have not responded. Does that mean they plan to live in violation, risking fines, or plan to sell or have just given up? A drive through the interior bay streets tells the story. Neighborhood after neighborhood is filled with homes still wrecked, homes under construction and homes where construction has clearly stopped. “For Sale” signs abound. Marticek said her agency continues to help people short-changed in their FEMA insurance claims. But for people like Fox, it will be another summer not at their beach or bay, as the endless season of recovery continues.